The Blue Water Desalination Legend series is the easiest watermaker system to operate. It features fully automatic operation through an industry-leading 7″ full-color touch screen control. 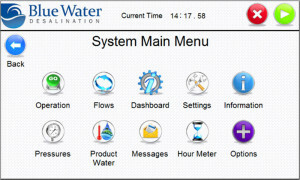 The system’s proprietary software constantly monitors and adjusts to compensate for changes in water temperature and salinity to ensure maximum production and product water quality. Each screen can easily be switched between Imperial and Metric measurement standards. The System Operation screen is where the system startup can be automatically initiated with a touch of the START button. All key pressures and flows are seen on the left side of the screen. 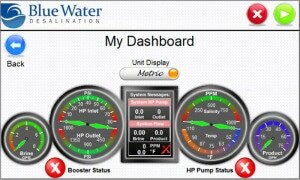 The My Dashboard screen displays a graphical representation of the key operating parameters of the system. 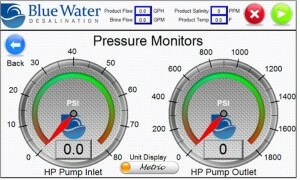 The Pressure Monitors screen displays the High-Pressure Pump inlet and outlet pressures. Additional key operating parameters are shown at the top of this and every screen. 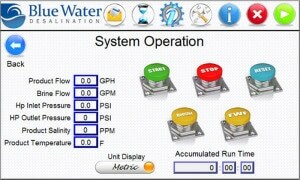 The System Main Menu shows the various options for monitoring the system. 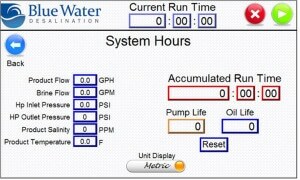 The System Hours screen shows run time and hours of operation until HP pump service is required. 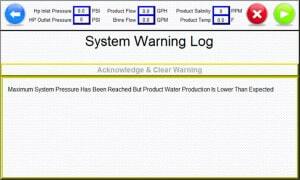 System Warning & Fault Logs give clear, concise messages to help troubleshooting and repair. The Legend controller also has screens that monitor system brine and product water flows, as well as product water salinity and temperature. In addition, the controller allows for manual priming of the system and manual operation of the backpressure regulator to control system pressure. A fully functional remote controller is also available to enable you to operate and monitor your system from outside the machinery space. In addition, the optional NMEA 2000 interface enables you to integrate, operate and monitor the system through any NMEA compatible display.